Former Cameron County employee Gilberto Escamilla, left, who is accused of stealing $1.2 million worth of fajitas walks with his attorney from the 107th District Court at Cameron County Courthouse in Brownsville on Monday. A former Cameron County juvenile detention center employee accused of stealing $1.2 million worth of fajitas waived his right to a jury trial Monday and is expected to plead guilty in two weeks. Gilberto Escamilla, 53, appeared in front of Associate Judge Louis Sorrola in 107th state District Court where his attorney, Gustavo Elizondo, made the announcement. The Cameron County District Attorney’s Office Special Investigations Unit arrested Escamilla last year after a driver from Labatt Food Service in Harlingen called the detention center’s kitchen to let employees know their 800-pound delivery of fajitas had arrived. Minor inmates at the Darrel B.Hester Juvenile Detention Center are not served fajitas and when investigators searched Escamilla’s home, they found packages of fajitas in his refrigerator. 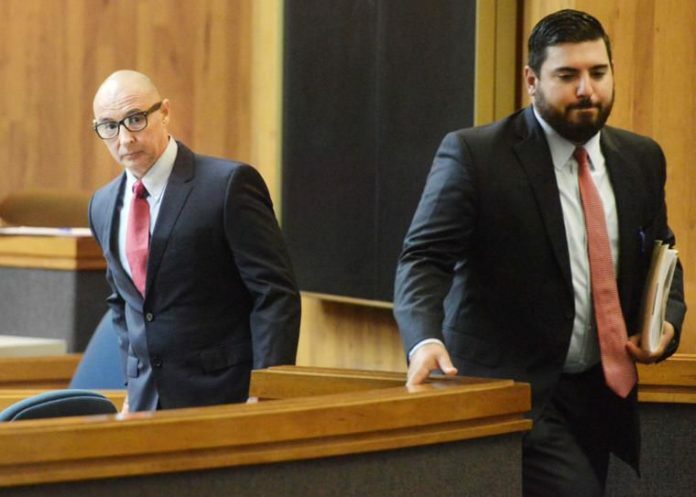 During the Monday hearing, Cameron County Assistant District Attorney Peter Gilman asked Sorrola to order GPS monitoring for Escamilla until the plea agreement hearing. “This is a time where he is starting the plea process,” Gilman said, explaining that Escamilla is charged with a first-degree felony for theft of the fajitas, which totaled around $1,251,578. Escamilla stands accused of using county funds to purchase the fajitas over a span of nine years.